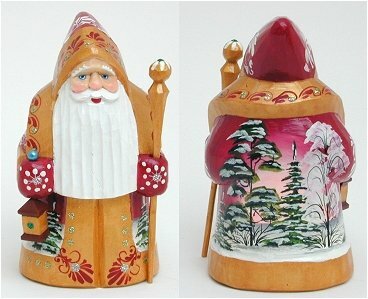 We have a nice selection of finely hand carved and painted figures all made of solid wood and hand painted by artists in Russia. These pieces are each unique and we have photographed each of them to give you a good idea of the wonderful details and colors they possess. We will update this page on a regular basis so do check back for new additions as we replace those sold. Cloaked in white this Father Frost holds a small tree and sack. 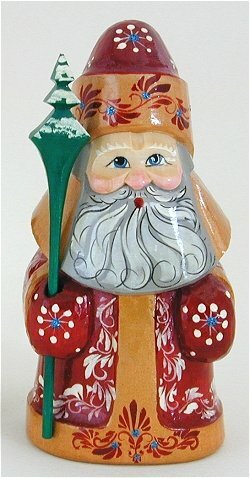 Cloaked in red coat with flowing decorated borders this cute Father Frost holds a staff. 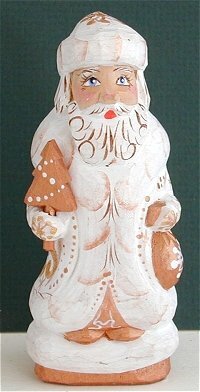 Small Figure is hand carved wood and brightly painted. Figure is hand carved wood and brightly painted. 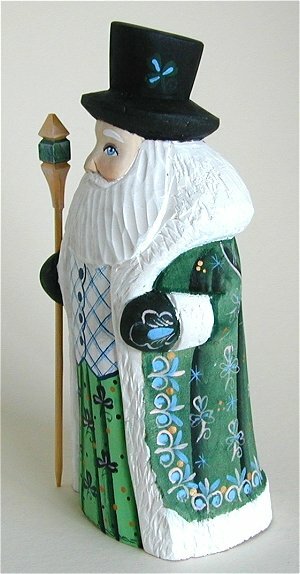 A beautifully carved peteite Father Frost with staff and lantern and wearing a red coat with gold trim. On the reverse is a small landscape scene as hsown in large photo. An Irish Santa decked out in top hat and a nice vest. 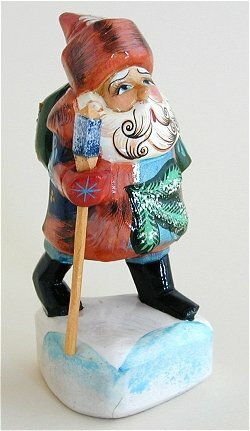 A walking Father Frost, unusual as he has actual legs rather than the normal covered figure with boots showing. Very cute and with a beautiful beard as shown in larger photo. A small figure with a staff and sack. You can see the detail of the carving which on a small figure is more noticeable as it defines the beard and hat.